Area: 2672 sq km. Location: The Atsutla Range lies south of the Yukon border in between Teslin Lake and the Stewart-Cassiar Highway, roughly 120 km NNE of Dease Lake. About 85km SW to NE and 40km at its thickest, it is bounded by the Jennings River to the north, the Teslin River to the west and southwest, Blackfly Creek to the east (a tributary of Ash Creek, and therefore the Jennings), and the line of Glundeberry and Nazcha Creeks. Its southern perimeter seems indeterminate, but lies somewhere north of Badman Pass (the main Teslin-Tuya Divide)...perhaps just to the north of the Nazcha Creek and the Nazcha Hills. 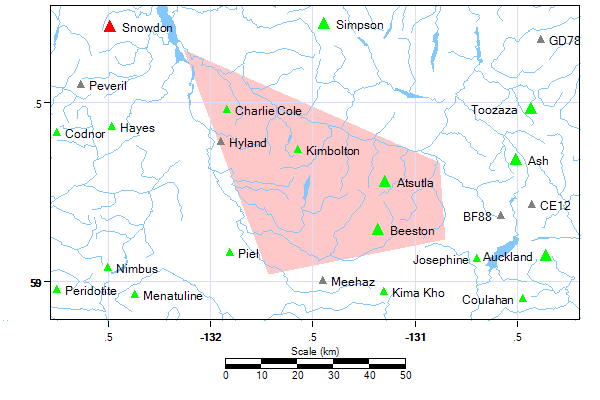 Neither the Nazcha Hills nor Metah Mountain nor neighbouring Isspah Butte are directly designated as being part of the Atsutla Range by Basemap, but there does not appear to be any significant demarcation between them - other than the wide final basin at the head of Nazcha Creek between the Nazcha Hills (which are just west of the Blackfly/Ash-Tuya divide) and the Atsutla Range peaks immediately to their north or, in Metah's case, a shallow pass formed by creeks 4.1km NE of the peak (which is also its saddle). One of these creeks feeds Nazcha Creek (to the south), the other Glundeberry Creek to the northwest, which feeds the Teslin River like Nazcha Creek (which flows into it). Because of the immediate proximity of Metah and the Nazcha Hills to the Atsutla Range, for the purposes of this encyclopedia they will be classified as part of the Atsutla Range as they do not belong to anything else. Mt Charlie Cole, which stands isolated from the range but in the angle of the Jennings and Teslin, will also be included in the area description. As simplified geometry requires, the area described by the boundary points takes in a lot of the surrounding lowlands and marshes as well. The collection of flat-topped and sometimes spired buttes to the south of Nazcha Creek are perhaps worth a name themselves, but for the most part are not even named and this is less of a range than maybe a plateau. This group includes Meehaz Mtn, Nuthinaw Mtn, Kawdy Mtn and Badman Point, just south of the confluence of Nazcha Creek and the Teslin, has a name at all. Being in the far north, these peaks are alpine in character despite their low elevation (1800-2000m+) and show signs of having been heavily glaciated; but the area seems too dry to support even small icefields. Terrain: "The [Atsutla] Range has an unroofed cored of granitic rocks intrusive into older, closely folded Paleozoic and Mesozoic Formations. The sharp peaks are glacially scultuprued, but many gently sloping upland surfaces are remnants of the uplifted and dissected Tertiary erosion surface of the Kawdy Plateau"